How do you manage dust on your open kitchen shelving? Do your dishes get dirty on your floating shelves? Today, I’m chatting all about cleaning kitchen shelves and how we manage dust and keeping our dishes clean. I’m kinda like a dinosaur with my kitchen shelves. You see, I’ve had them for almost three years and that was just before the time that they got popular. We used them while we were still renovating the kitchen and have used them consistently since the kitchen renovation back in 2016. Of course, after living with something for that long, you develop habits for it. So, I thought I’d share what I do to keep our shelving looking nice. It’s not hard. Promise! I don’t have a specific time or day that I schedule to clean my shelves in the kitchen. I look at my shelves and if there are a lot of the dishes in the dishwasher and it’s been awhile since I cleaned the shelves, then I clean them. The picture, above, is a good example of a time where I’d cleaned the shelves. Most of our bowls, mugs and cups are in the dishwasher right now. I have less to take off of the shelves, so it just makes it easier. The first thing I do when cleaning the open shelves is remove all the plants, decor, dishes, etc. Since this is your kitchen, there will be grease on top of just regular dust, so it’s important to take everything off the shelves to clean really well. Once I have my shelves empty, I wipe it down with a dry cloth. It’s hard to photograph dust, but trust me, it’s there but it’s not a crazy amount. Most of the year, I have my Christmas Cactus on my shelf and, when it flowers and drops, it’s hard to see all the dried flowers unless you are eye level. So, I do one really good wipe with a dry microfiber cloth to get it wiped down. I then will go back with the backside of the cloth and do another wipe down (top and bottom of the shelves as well as the one side that is showing). Every six months or so, I will add in a wood cleaner. I try to limit what I put on the shelves and, in general, the chemicals I use so I don’t do this often. The shelves don’t feel or look greasy but the grease does show up on dishes and the tile wall, which is interesting. After I wipe down the shelf, I usually use a small bit of a magic eraser to clean the tiles above and below the shelves. The grease sticks on the tile and a damp cloth and soapy water just won’t cut it down. 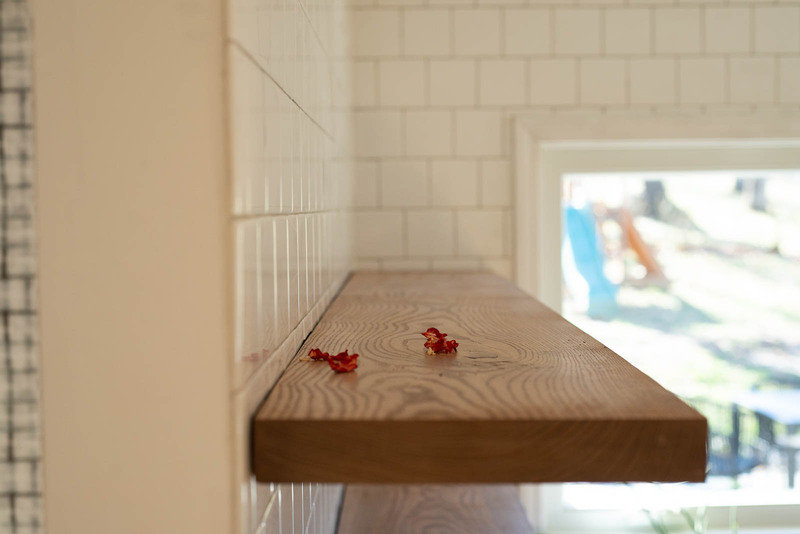 Do your dishes get dirty on your floating shelves? Let me answer this by saying yes and no. The dishes that I keep on the shelves are used every day. We rotate them in and out through the dishwasher all the time. Those dishes don’t get dirty sitting on the shelves because they aren’t up there long enough to get dirty. The dishes that do get dirty are our glass canisters that hold our smoothie toppings and the planters. They don’t cycle in and out of the dishwasher so they do collect grease and dust. It’s not a big deal to me. When I’m cleaning the kitchen shelves, I clean each vessel that doesn’t cycle through the dishwasher at the same time. For the smoothie topping canisters, they run through the dishwasher when we empty them and then I wipe them down while I’m cleaning the shelves. For the planters, I’ll use water and wipe them down when I’m watering the plants and again on the day I’m cleaning the shelves. I’ll use a wipe and just wipe the planter pots down. 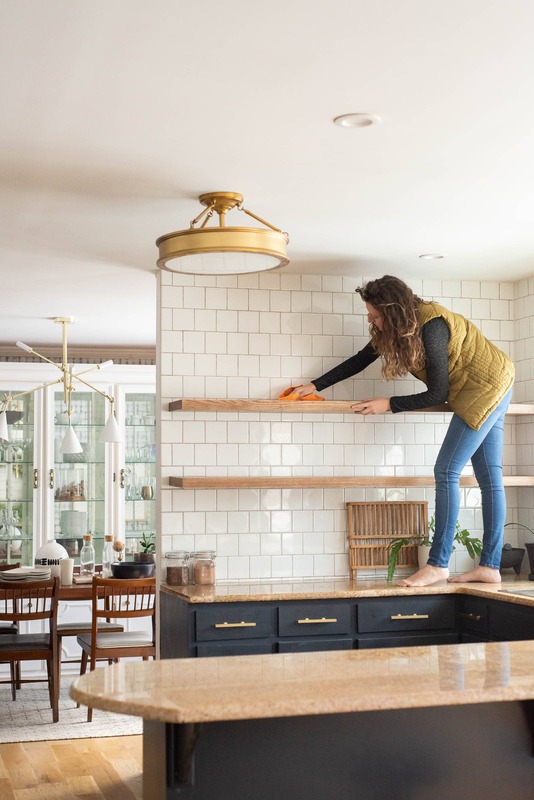 I hope that helps answer some of your questions about cleaning kitchen shelves and whether or not the maintenance of having open shelves is something you can handle! We still love having them. p.s. 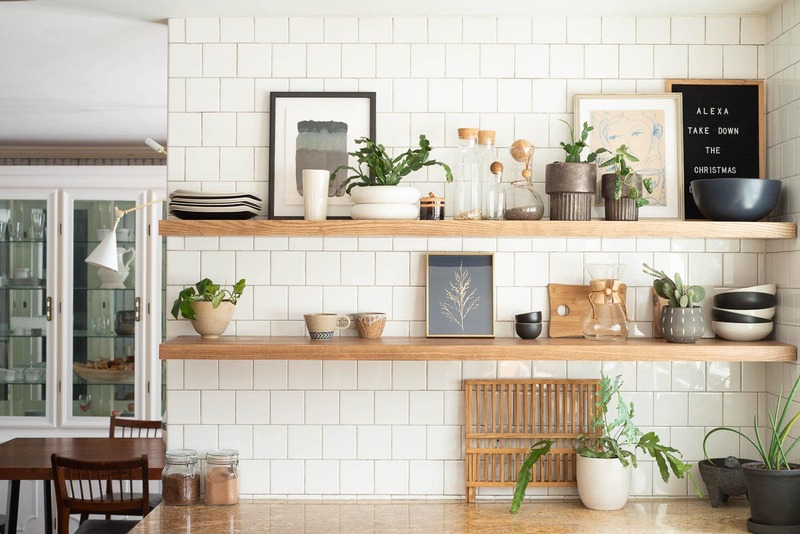 If you decide they are right for you, you’ll want to check out my Open Shelving Guide which includes a TON of links about our kitchen shelves including the brackets that we mounted them with! Also, for shopping links, find them on the SHOP MY HOME tab. Thanks! !